Seasonal clean up is a critical component of maintaining a neat and healthy yard. Without it, pests and diseases thrive while desirable plants don’t get the nutrients, air and sunlight that they need to survive. Keeping a yard clean and well maintained is a big job, and that is why it’s so essential to let the professionals at Boulder Falls Landscape handle this chore. 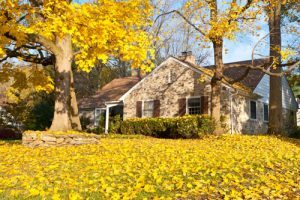 Many homeowners don’t realize how important seasonal cleaning is to their yard. However, the reality is that a clean yard is healthier and safer as well as being a pleasure to look at. When cleanups are performed on a regular basis, other yard chores are easier to manage and homeowners start to see that their grass, trees and plants are flourishing like never before. The changing leaves look gorgeous until they end up scattered across the lawn and garden. If this debris is allowed to sit, it can wreak havoc on the health of various plants and grasses. That’s why Boulder Falls focuses on removing dead leaves and other debris from autumn storms as quickly as possible. They also prune shrubs and trees to remove overgrowth, giving yards a tidy look before winter arrives. Whatever the season, a thorough yard clean up makes it far easier to enjoy the full beauty and functionality of lawns and gardens. Call Boulder Falls Landscape at 360-991-1347 to learn more about spring and fall yard cleanup services that keep houses looking their best throughout the year.